I look forward to the new elderflower season like some look forward to the new football season! Round here there are elderflowers growing everywhere from May - June: such a short season. But if you're clever the season extends - if you know the microclimates. Within a 20 mile radius the season changes by a few weeks depending on microclimate & land height. There's a secret place I picked the ones above when all the others everywhere had finished. Elderflowers discolour (go brown) with age & also when cooking. Add lemon as I did with the elderflower liqueur below or citric acid to avoid the discolouration. The elderflower season is so short! That's why we make cordial, liqueur, sorbet, etc. But you can also make the elderflower poaching liquor that I use for the elderflower poached chicken & salmon below and freeze that in batches to use over the following summer months. Elderflower liqueur - you can use gin or vodka as a base. Go on try it! This is a ancient recipe from my friend's recipe vault - many times tested and approved! 1. Add sugar to the boiling water and stir till dissolved. 2. Add lemon and orange zest and slices. 3. Place elderflowers into a deep container. Pour over the sugar/ lemon/ orange mix. 4. Cover and leave for at least 12 hours. 5. Sieve and strain through muslin bag to clarify. Pour into sterilised bottle. 6. Place in a very safe place that nobody else knows about - or they won't last long! Use the elderflower cordial above to make this turkish delight. 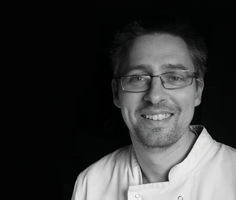 But put the cordial in at the beginning not the end like the first time I made it - it sets firmer this way! 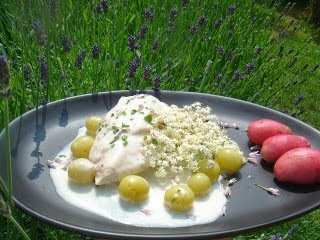 Chicken poached in elderflower - a Broadway classic from 2007. We have also often done a similar version with salmon. This particular one was a 2009 vintage - definitely time to make it again! Here's a link to these. I made them at one of her supper clubs I was helping at - literally walked out of the front door to pick the elderflowers and back in the kitchen to fry them off - couldn't be fresher! Hope your day goes well! I love elderflower so looking forward to see what you cook/make/write about. Love your blog! We lived in Bath for two years so I remember walking by all the elderflowers along the canal tow path. Wish I would have had all your recipes back then. 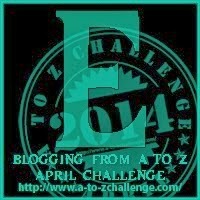 Found you through the A to Z challenge (and I'm happy I did).